New Delhi, January 3, 2017: ‘Running Wild with Bear Grylls’ is back, as the famed survivalist takes a new host of unsuspecting celebrities under his wing to explore some of the most remote locations around the world. First up joining the renowned adventurer is triple-platinum recording artist and actor, Nick Jonas, followed by SAG Award-winning actress, Courteney Cox, as Bear takes them on the 48-hour extreme survival challenge of a lifetime. Airing exclusively on the Discovery Channel, other big name celebrities from the world of showbiz joining Bear include: dancer and Emmy Award-winning choreographer, Julianne Hough; stage and screen actress and singer, Vanessa Hudgens; alpine skier and Olympic gold medallist, Lindsey Vonn; and Hall of Fame basketball player, Shaquille O'Neal. Each of the accomplished actors and athletes will partner with Bear for two days for a one-on-one adventure they will never forget. 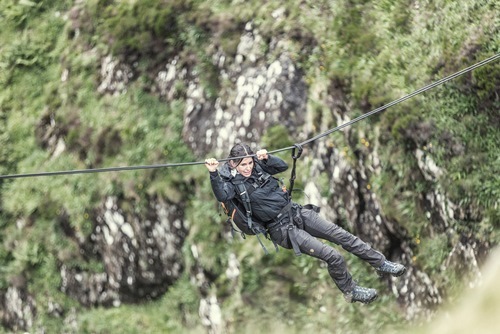 Running Wild with Bear Grylls will air every Thursday at 9 PM starting January 5 on Discovery. From the remote African Savanna and mountain passes of Sierra Nevada to the wilds of Ireland and rocky shores of Corsica, the intrepid cast members will face their deepest fears and tackle everything from wild animals to rock rappelling as they journey through some of the world’s most unforgiving wildernesses, learning a little more about themselves in the process. Pushing their minds and bodies to the limit to complete their journey, they experience the excitement of being dropped into uncharted territory and tackling the wilderness head-on, which is daunting and draining, but also very empowering. · Television icon Courteney Cox joins Bear on a harrowing journey to Ireland on this week’s Running Wild. Dropped along the wind swept coastline, Courteney and Bear must navigate jagged peaks and descend sheer cliffs, only to be battered by ocean swells. As they contend with the elements, the two struggle to stay warm and must subsist on a meager diet of maggots sourced from a rotting sheep. Courteney’s limits will be tested, but her spirit shines while sharing insights on aging gracefully, the loss of her father, and the joy of motherhood. · Olympic gold medallist Lindsey Vonn takes a speedboat trip with Bear, before they swim to shore, cross a chasm and dine on sea urchins. How will she get on? · NBA legend Shaquille O’Neal joins Bear on an oversized adventure to the remote Adirondacks on Running Wild. After being plucked from a freight train via helicopter, Bear and the 7’1” Shaq battle dense forest, blood-sucking leaches and two-hundred-foot sheer rock faces in search of their extraction point. Along the way, Shaq’s infectious energy, tales of legendary NBA moments, and unwavering drive to be help others remind us why he is beloved the world over. The wild will dole out everything it’s got, but it’s never met a force of nature like Shaquille O’Neal. · Actress, singer, dancer, adventurer Julianne Hough joins Bear on a roaring adventure to the African Savanna. Julianne (Dancing With The Stars, Grease: Live!) and Bear initially navigate the unforgiving African terrain on ATV and must elude a pack of elephants that block their path. Rappelling from a sheer cliff, they enter a remote canyon where they evade a pack of big cats, come face-to-face with a massive snake, and navigate treacherous waterfalls before reaching their extraction point. As they make their way through the dangerous and unpredictable terrain, Julianne shares her personal story of abuse, and the positivity and unwavering determination that got her to the top. · Music sensation Nick Jonas joins Bear for an icy journey across the Sierra Nevada mountains. With a blizzard bearing down, Nick and Bear must rappel down a sheer rock face before navigating an avalanche-prone mountain face. Building camp under harsh conditions, the two feast on a frozen bird, and eventually make a heart-stopping swim across a freezing lake. Along the way, Nick gives us the definitive account of theJonas Brothers’ split and reveals how his struggle with diabetes gave him the drive to reach the pinnacle of the music world. · America's Got Talent judge and pop icon Mel B roughs it with Bear on the shark-infested waters of the Irish coast. · Bear takes Hollywood sweetheart Vanessa Hudgens to the High Sierras for a rigorous and scenic adventure. After a breathtaking repel from a helicopter, Bear and Vanessa evade a boulder avalanche, summit a massive dormant volcano, and come face-to-face with a rattlesnake, which makes for a cringe-worthy dinner. Along the way, Vanessa reveals her struggle to accept the passing of her father, and shares insights on her meteoric rise to stardom. Bear Grylls has become known around the world as one of the most recognised faces of survival and outdoor adventure. His journey to this acclaim started on the Isle of Wight, where his late father taught him to climb and sail. Trained from a young age in martial arts, Bear went on to spend three years as a soldier in the British Special Forces, serving with 21 SAS. It was here that he perfected many of the skills that his fans all over the world enjoy watching him pit against mother-nature. Bear went on to star in seven series of Discovery Channel’s Emmy nominated TV show Man Vs Wild as well as Born Survivor, which has become one of the most watched shows on the planet, reaching an estimated 1.2 billion viewers. Most recently, Bear starred in Bear Grylls: Breaking Point for Discovery, in which he helped everyday people conquer their fears in extreme situations. Off-screen, Bear has led record-breaking expeditions, from Antarctica to the Arctic, which in turn have raised millions for children around the world. In recognition for his expertise and service, Bear was appointed as the youngest ever Chief Scout, and was awarded an honorary commission as a Lieutenant-Commander in the Royal Navy as well as a Lieutenant-Colonel in the notoriously tough Royal Marines Commandos. Discovery, the flagship network of Discovery Communications, is devoted to creating the highest quality pay-TV programming in the world and remains one of the most dynamic networks on television. First launched in 1985, Discovery reaches 220 million subscribers in Asia Pacific. It offers viewers an engaging line-up of high-quality non-fiction entertainment from blue-chip nature, science and technology, ancient and contemporary history, adventure, cultural and topical documentaries.